Trying to cram one extra large Chip in was a bit of a mistake. Broken bits flew everywhere. The Chips were of the right thickness to maintain the Kettle Cooked look and feel, and as there were very few that were flat, the folded edges and doubled over Chips provided a harder, firm crunch than the crispy snap of regular Chips. 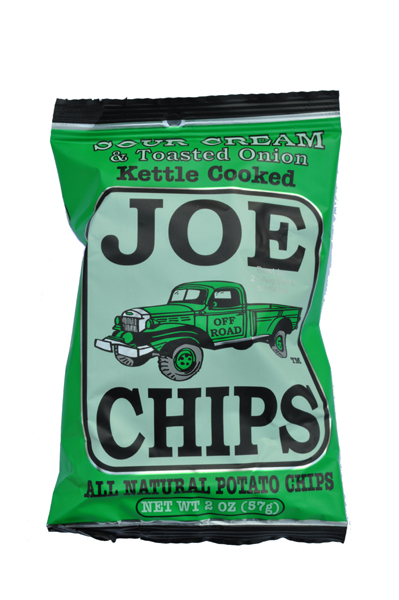 These Kettle Cooked Chips were very light in color, which made the visible potato skin on many of them stand out more clearly. There were the usual blemishes, but they looked and felt fresh. There wasn't much in the way of oil bubbles, but the surface of the folded and gently curved Chips was generally rough. The Nose Plunge Test revealed little of the contents within. There was no smell, but bag. These did not taste as creamy as some Sour Cream Chips. Neither did it taste particularly oniony. There was certainly nothing noticeably Toasted about the Onion. The combo appeared to be like a rather overcooked Cheese & Onion, with a touch of salty potato. Indeed, if they were called Cheese & Onion we would have probably given them a better mark.